Classic, 57 seat Red Routemaster Wedding Bus. This traditional, double deck London Bus is the perfect way to transport all of your wedding guests in one go. A wedding Bus is a very cost effective way of transporting the bridal party, bridesmaids, friends and family all together and ensuring that everybody arrives on time and in style. 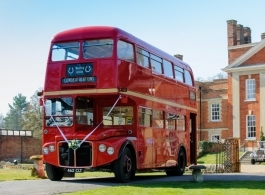 Up to 57 passengers can travel to your ceremony venue and on to the reception in this historical and unique London Bus. White ribbons and an artificial bouquet of flowers on the front of the bus are included in the price and you can choose from additional extras such as personalised blinds & tickets etc.